Catalyst Group conducted a study pitting Bing versus Google and found some interesting results directly relevant to Web professionals. In the study, a search for "digital cameras" resulted in far more time on-page for Bing than Google. 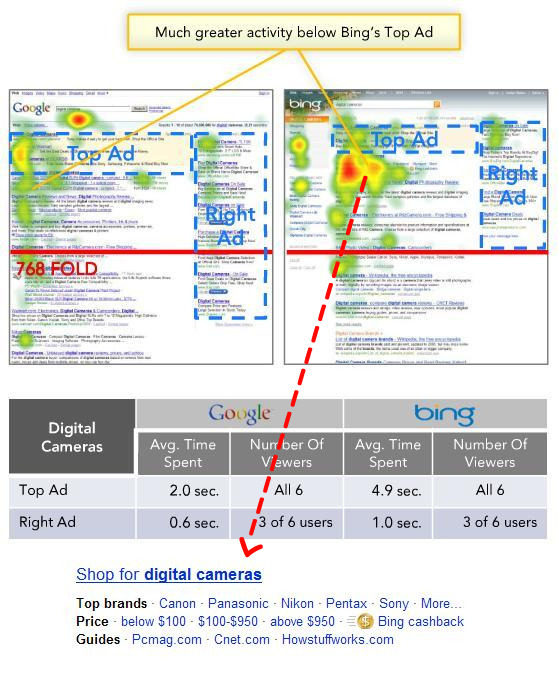 Bing users also spent 150 percent more time viewing the area directly under the ad space (see heatmap below). While one could argue that the increased time spent looking at that area would result in increased exposure for the ad, a look at the heatmap suggests the ad is not being viewed as heavily, but the options below the ad. This includes sorting options for cameras and facilitates direct shopping through Bing. Google has a similar area, although it is four results below the ad, and links point to one camera with several different vendors, rather than several different cameras. For the Web professional, this suggests a significant incentive to getting your products listed with Bing Shopping. Another interesting finding from the study is that Bing users spent less time on page with Bing than Google, when searching "digital cameras" and "hotels" (two control search terms.) For "digital cameras," Bing users spent 10.5 seconds on the results page (15.7 seconds on Google) and "hotels" saw Bing users spending 10.6 seconds (14.8 for Google.) An earlier survey in the study also found that Bing users found the search experience more organized and offering more helpful information than Google. Piecing the two together, it can be argued that users spent less time on Bing because they were finding what they needed faster. The bad news for Bing is that users are not feeling compelled to make a switch from Google. Reasons cited were familiarity and the integration of other Google apps. A positive for Bing is that users found search results equally relevant between Bing and Google. Although users are saying they are not likely to switch, if the results are just as good, Bing stands a good chance at eating away market share from Google once users become more familiar with the new search, or as new users come online. You can read the entire Catalyst Group Study. Don't miss Website Magazine's August issue, where Dante Monteverde's SEO Corner focuses on optimization for Bing. Not a subscriber? Get your subscription now!